Are you an edgy or a fancy girl when it comes to special events? Well, I am certainly both, because I am planning on wearing on Christmas eve my Christmasy sweater with leather skirt & booties, but for the Christmas day I’ll be wearing my fancy dress (which you will soon see in pictures). Haha, isn’t it weird that I already have planned out my Christmas outfits? Am I the only one? Have you figured out what you’ll be wearing these holidays? Well if not, I decided to make a little post via global shopping site Persunmall & show you two outfit ideas that in my mind could work really great in Christmas! I have been a fan of Persunmall since July, I guess, because every item I have got, has been good quality and the shipping is relatively fast as well, usually I get everything in less then 3 weeks time! The store has some pricey items too, but a lot of the things they offer are really affordable, for example, in this collage you can get the dress, the sweater, the shirt & the skirt under $25! I want to announce the winner of the Jollychic giveaway!! lovely outfits, dear! 1st is my favourite) nice ideas! Love the edgy look, such a cute idea. Amazing selection, I love that emerald dress, so festive! Both types of looks work super well for the holidays, thanks for sharing these pieces! I think i like to combine , as you do. Fancy always need a BIt of an edge, I think! Great selections and great prices, love the emerald green! I totally agree with you, I'm both as well! Both are such sunning looks, you make it difficult to chose…I know both outfits on the same day, one for day one for night! I am totally fancy! I love dressing up and I love that green dress. It's so adorable!!! Loving that green dress, so pretty and festive!! 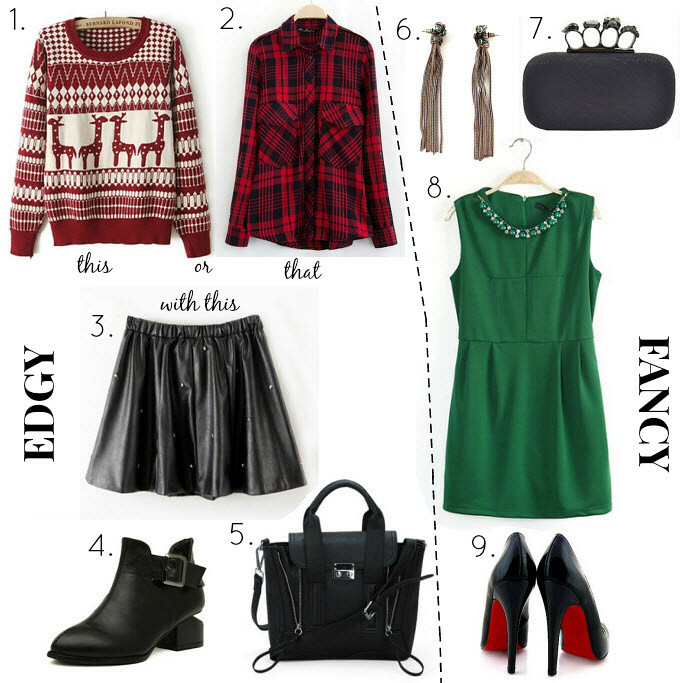 Love these pairings – the leather skirt with a casual festive sweater is brilliant! The added edge is so fashionable. The first sweater is so cute. Hope you are all set for the Christmas Maddie. I love both looks, but myself I'm more of a girly girl. So I'd go for the fancy outfit. I love the first jumper!!! I love the first look without the sweater! First outfit is perfect, this sweater is so cute ! Maddie this selection is beautiful! love the green dress! we love the dressy dress, especially the embellishments which double as a necklace! I love the bag N°5 so much! I wish you a happy christmas my friend ! We love red and green outfits, so we love your proposal! el bolso satchel estilo 3.1. Phillip Lim me encanta! I just love your selection for the edgy look. So cool. I love doing Christmas recipes myself. So fun! I like the fancy look, the green dress is so pretty! Fancy is absolutely my favorite, love the green dress. These styles are so refreshing from the usual! I love that green dress and leather skirt. Very pretty!